AmaWaterways invites you to join TV personality, and the Godmother of the new extraordinary AmaMagna, Samantha Brown, on a cruise along Europe’s legendary Danube River. What celebrated travel expert Samantha Brown enjoys most about travel is not necessarily the “must do’s” of a destination—visiting the iconic museums, majestic castles and celebratory monuments. What she loves the most is meeting people, getting to know them and spending time with them as they go about their everyday lives. 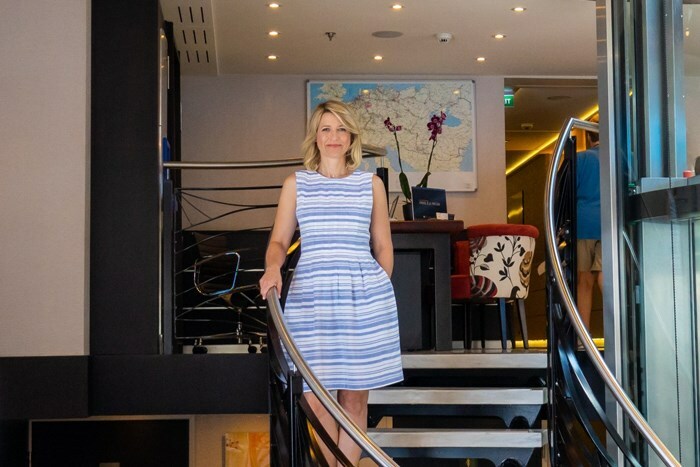 Samantha Brown will sail on board the one-of-a-kind, new AmaMagna on the Romantic Danube departing July 14, 2019 from Vilshofen, Germany to Budapest, Hungary, and she invites you to join her. Samantha will share insider tips and stories with you during two engaging presentations on how to really appreciate the essence of travel. AmaWaterways named Samantha Brown Godmother of the extraordinary, AmaMagna. She will “bless” the one-of-a-kind ship during a special Christening ceremony that takes place earlier in July. The AmaMagna, a ship at twice the width of traditional European river cruise ships, offers incredibly spacious riverview staterooms, four unique dining venues and five bars. Travelers interested in health and wellness can take advantage of a large swimming pool and whirlpool on the Sun Deck; the expansive Zen Wellness Studio, featuring a fitness center and spa services, including manicure and pedicure services; as well as an innovative Water Sports Platform with a Sundowner boat that takes guests even closer to the Danube.